Dating back the the 1300s, the Cologne Cathedral, also known as the Kölner Dom is extremely impressive and beautiful at the same time. Located just outside of the main train station, the Cathedral is a very popular hang out for not only tourist but locals as well. In fact, the brewery for Cologne’s most famous beer is just around the corner. After climbing 533 stairs to get to the tippy top of the 515ft tall tower, the view was stunning! Despite being hit by 14 aerial bombs during WWII, the Cathedral survived and was restored by the city. This photo shows the one stained glass window that was blown out and then redesigned. Although it is meant to be modern and abstract, we actually found the new pattern to be quite ugly and out of place. The detailed doorways with amazing carved figurines! The Cathedral was constructed from limestone, which is white. 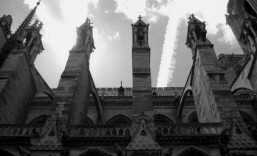 After decades of absorbing pollution, however, the pure white limestone has turned black, giving the cathedral its ominous black appearance. These pieces here have just recently been carved and put back in place, standing out as still clean and white. The back side of the Cathedral, which is where the relics of the Magi have been held for centuries.